There are various types of amaranth. 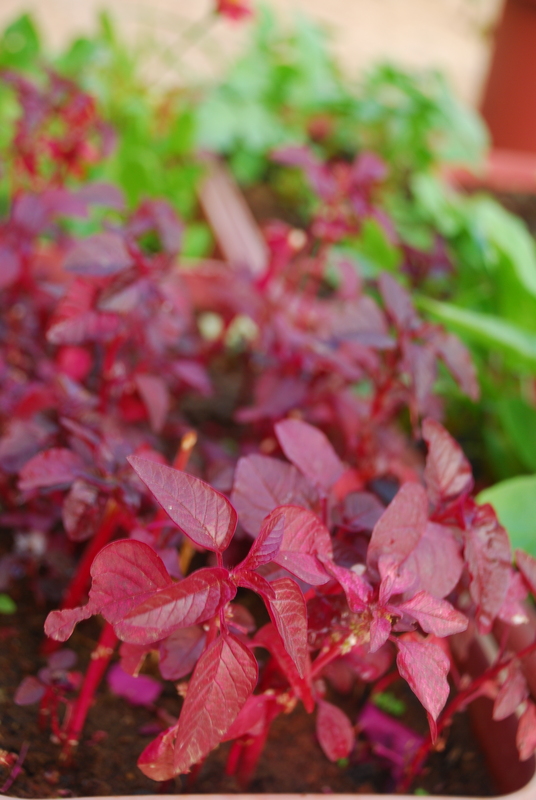 In India the most common varieties are red and green amaranth, also called laal maath and chowli respectively. It is an amazingly productive and reproductive leafing and seeding veggie – germinating easily, resistant to pests, adaptable to various climates and seasons, bountiful in production of leaf and seed and highly nutritious. For this reason it is revered by organic farmers and alternative thinkers as a “doomsday veggie”, one capable of providing human sustenance in the worst of times. SEASONS: Amaranth is an annual. It is well-suited to Mumbai and can be sown and grown in all seasons. PROPAGATING: This plant is propagated from seed. Buy seeds from your garden shop, or raid your kitchen larder for amaranth cereal/seeds. 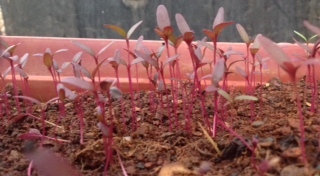 GERMINATING: Amaranth is best germinated in germination dishes/seeding baskets prepared with a mixture of compost and peat moss. Seeds can be shown in shallow, 1/4 inch deep holes or scattered on the surface with a sprinkling of soil above. Place in semi-shade and spray water evenly. Spray your sown seeds daily until seedlings emerge in 5-7 days. PLANTING OUT: Transplant to slightly acidic, well-drained, compost-rich soil in full sun in 2 weeks. Amaranth seedlings are fragile and need to be handled carefully, ensuring that seeding soil is scooped up along with the root ball and the entire thing planted together in its new home. Amaranth can be planted out in close proximity of a few inches for leaf harvesting, or up to 2 feet apart for a tall and lush crop and for seed harvesting. Amaranth grows well on open plots and in medium to large containers. NURTURING: Water each day, twice a day in summer. Amaranth is a hardy plant that can sustain all of Mumbai’s seasons, but is prone to leaf-eaters when planted too densely. Weed regularly, with an eye out for those clever imposter weeds that look like amaranth, but are not! HARVESTING: Amaranth is a highly nutritious plant that is harvested for its leaves and its seeds. Harvest its leaves by cutting the stem a few inches above soil level. For seed harvesting, you would need to have spaced out your crop so the plants grow to full size (up to 5 feet high). Cut off seeding heads, thresh and dry for storage or immediate use. Each full grown plant will produce leaves through the season (4-5 months) and a mature flower head will contain thousands of tiny seeds. You can also let a few plants go to seed so their flowering heads mature, dry and get dispersed by the wind to neighboring soil for a new crop. When productivity dips/or you have fully harvested the plant for its leaves and seeds, uproot the plant, compost, and replenish your soil. Use that space for growing fruiting or rooting veggies next. Thank you for this well laid out article. This is my first time growing a plant from seedlings and I’m still in doubt about how many seeds to sow. I have a pot 11x11x12 inches which should be big enough to support the plant to adulthood. Are 4-5 seeds enough? Well, if you are growing amaranth then begin in a seed starting mix with thickly sown seeds as the saplings are extremely fragile. Once the saplings emerge and grow hardy you could separate the root balls and transplant into bigger containers. So yes, you would need about 20 seeds at least for a container of that size. I’ll help this in mind. Will post an update in a few weeks time. One of the saplings was missing both leaves when I got home one evening (insects?). 2 of them have developed grayed out leaves. The pot is outdoors but not in direct sunlight. Wondering if I should place it indoors near a window. Amaranth needs full sun so yes, please do take your pots outdoors/as close to it as possible! Hi Nilesh, I’m afraid I would not be able to guide you on this as I have never farmed amaranth commercially. You could join our facebook group called Mumbai Farmers and post your question there. Perhaps someone may be able to guide you.